On this date in 1942, the Orthodox Bishop Gorazd — Matej Pavlík is what his parents named him — was shot in Prague along with priests of Sts. Cyril and Methodius Cathedral for sheltering the Czechoslovakian resistance fighters who had lately assassinated Nazi Reichsprotektor Reinhard Heydrich. After icing Heydrich, the assassins had taken shelter in the Cathedral basement … only to be betrayed by a onetime compatriot. The Nazis besieged the church — fiercely, but hopelessly defended. With the Germans already visiting unspeakable collective punishment for the murder, the act of sheltering the assassins had trouble written all over it. The Serbian-consecrated first bishop of the Czech Orthodox Church, Gorazd sought to limit the potential scope of reprisals by writing the German authorities, directly claiming responsibility — even though, in fact, he hadn’t found out who his sanctuary was concealing until several days after they had already been installed by sympathetic priests. He enjoyed the characteristic hospitality of the Gestapo, and was shot at Kobylisy along with priests Vaclav Cikl and Jan Sonnevend; theologian Vladimir Petrek followed them the next day. 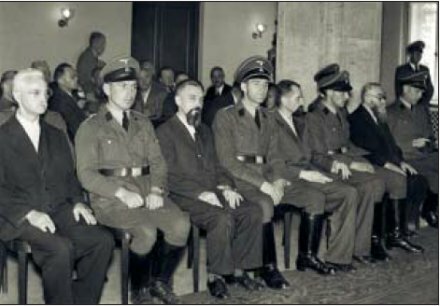 From left to right (not counting the guards, of course): Jan Sonnevend, Vaclav Cikl, Vladimir Petrek, and the bearded Bishop Gorazd, at their public show trial September 3. From the Czech Ministry of Defense’s slick and well-illustrated publication (pdf) on Operation Anthropoid. The Czech Orthodox Church was suppressed while the Germans held Czechoslovakia. Bishop Gorazd is recognized in the Orthodox martyrology on August 22nd (the date of his death per the Julian calendar).